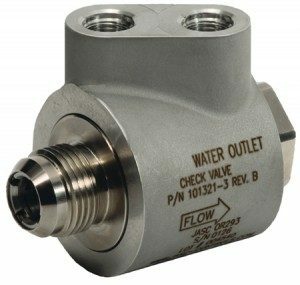 This Water Cooled Liquid Fuel Check Valve is a state-of-the-art application and is a modified version of our Liquid Fuel Check Valve that incorporates active cooling of the check valves’ internals with no changes to fuel lines necessary. JASC’s Water Cooled Liquid Fuel Check Valves ensure that a Class 6 seal is maintained in the check and reverse flow direction from hot gas path to hot gas path. Request JASC’s Water-Cooled Liquid Fuel Check Valve technical drawing here. Water Cooled Liquid Fuel Check Valve technical drawings are available. Request them here.